Discussion in 'New Member Introductions' started by Writing Forums Staff, Apr 27, 2014. This is the quick and dirty to get you up and running in the forum. We will give you links throughout that will take you to the more detailed information. Yes, I know… You didn’t click the above link. That’s cool. Continue on to the end and then come back to this one. Seriously. Come back. There is more detailed information in the Forum Rules concerning screen names, but one important point that should be mentioned right now, before you get started: If you are using your real name (or some version thereof) as your screen name, you may wish to reconsider. WE DO NOT DELETE ACCOUNTS. EVER. If your digital footprint is of concern to you, using your real name is not a smart move. If you want to change it, please contact Komposten now before your name gets quoted or mentioned in forum conversations, posts, etc. Though our membership is worldwide, English is the language spoken here. We are NOT a G-Rated forum, but that's not license to swear like a drunken sailor. If you've not used a Xenforo™ forum in the past, please know that it handles broken, wonky or missing BBtags differently than other forum platforms. VBulletin forums and other platforms just leave broken or unpaired tags as they are rendering a "broken quote" or "broken tag" while Xenforo™ tries to remedy the situation when it can (sometimes it just leaves it alone) by adding the missing or broken opening or a closing tag at the beginning or the end, respectively, to even up the pairs. If you're that person who loves to explain to forum newbies the ins and outs of BBtags and this is your first Xenforo™ forum, the [noparse][/noparse] tag in Xenforo™ is the [plain][/plain] tag. We're a writing forum. The venue is writing. If you're here to push and link your off-site blog in every post you make, this is poor forum etiquette and isn't something that will be tolerated for long. If you want to change things in your profile, just hover your cursor over your screen name to the right of the forum and you will get the following pop-up window. Pretty self explanatory after that. But I want to post my STORY!! If you’re here, you probably have a work in progress that you’re dying to post to get critiqued, right? Of course! And we’re dying to give it a thorough critiquing, but our forum has some requirements that all of us have had to meet prior to being able to post in the Writing Workshop. 2 constructive critiques given to items already in the Workshop for every item you want to post. This means 2-for-1 all the time. If there are 10 unique items you want to post for critique, you need to have at least 20 critiques given by you. 2-for1. All the time. It's not 2 crits and then empty your hard-drive into the Workshop. Have I been annoyingly clear? NOTE: The Writing Workshop is the only place where you may post your writing for critique! All writing that is posted outside of the Workshop (unless it's an entry in one of our Writing Contests) will be deleted. Itching to post and can't wait to meet the requirements? Consider becoming a supporter, and bypass the requirements of 14 days and 20 posts! You still have to comply with the 2 for 1 rule. Here are 7 questions you should answer before posting your work for critique. When you meet the requirements and get ready to copy-paste your story into the forum, your formatting is going to go a little wonky. This is a common issue with all forums, all platforms, and has to do with the fact that different word processors, different kinds of computers, and different forums all use different formatting tags. You may need to add missing or remove extra line breaks. Also there will be no indents at the beginnings of your paragraphs. Don't try to cleverly include them with invisi-text, please. I've met the Requirements and I still can't post!! If, after having met all the requirements to post in the Writing Workshop, you still can't start a new thread in there, please PM a moderator (click here). We are happy to help you get your thread up and running. I. The top section is where you can post questions concerning different aspects of writing, publishing, brainstorming etc. Publishing - Exactly what it sounds like. Marketing - We do not actually market in here, we discuss the ins and outs of the topic. Character Development - Fill in and flesh out those actors. Plot Development - Get help moving the story from A to B to C.
Setting Development - Build that world! Word Mechanics - Slept during 6th grade grammar? It’s cool. We all did. Here’s where to get help with the nuts and bolts. Research - Have a question about a thing? Here's the place for the question about that thing! General Writing - For when your question doesn’t fit in the other areas. Don’t be lazy and dump all your questions here. By the Genre - For when you want to ask questions specific to your genre. By Writing Form- This is where you ask questions specific to the type of writing, i.e. novel, script, short story etc. II. The second section is Applied Writing - This section is new and may undergo changes as it finds its place in our paradigm. The Art of Critique - This is NOT WHERE YOU POST YOUR WORK. This is where we talk about how to give good critiques. Writing Contests - We have plenty! NaNoWriMo - A discussion forum for National Novel Writing Month. III. The third section is the Writing Workshop. Yes! This is where you give and get critiques on Works in Progress (WIP’s) including your own. The Lounge - Relaxed topics, enjoyable chat. Debate Room - Not for the faint of heart. The 1st rule of Debate Club is that you don’t cry over a busted lip. You can't view or participate in the area when until you've been a member for 90 days and made 100 posts. New Member Introduction - Say hello and tell us about yourself. Role Play - Role Playing Games served hot and fresh. Book Discussion - Want to chat about your latest read? Here’s the place. Writing Prompts - This is our word games area. Oscar Leigh, Ben James, Apo and 16 others like this. This is a great idea. I love the layout, the tone, the content... The overall presentation is a nice introduction. Kudos staff. Oscar Leigh, 3:12 C.L., Talltailor and 6 others like this. It might be better to have IV at the very top of the forum and to have the General Writing subforum at the bottom of I. Perhaps the Workshop section could go near the top as well. I guess we'll have to see what Daniel thinks because he's the only one who can make the changes. I absolutely agree with General Writing being dropped to last position in the upper quarter. My impression is that General Writing is one of the most - if not the most - popular forum. If that is the case, I think it should stay at the top of I, IMHO. That's the problem, though. Too many members use that subforum to post threads that would better be suited for another subforum. I'm not sure that changing the order would change the behavior. OTOH, changing the order would work an inconvenience for those who use it appropriately. i have to agree with ed... besides which, 'general' just naturally makes more sense being placed before getting specific, doesn't it? The problem is that a lot of new members post threads about plot creation, characterization, or grammar in General Writing without bothering to check the other subforums. The mods have had to move a lot of threads lately as a result. Cleaning up General Writing is #3 on my daily routine of things to do. #1) Check the Mod-Chat for any goings-on I've missed. #2) Deal with reported posts that haven't been already taken care of. While I agree with Ed and maia's concerns, I also think moving General Writing down might be a good idea so that new members actually look through the other forums first. Then again, there is a chance that it wouldn't change anything, as Ed suggests. Members may see the other forums, but they may not be entirely sure of where to put their posts... Although, then I might question their reading comprehension since the forum names are pretty self-explanatory and one would think people cognizant enough to scroll through the whole page before deciding to post anywhere... Maybe it would be good to sticky this somewhere like New Member Introductions and/or add something into the rules (or here) about being sure to read the forum descriptions before deciding where to post new threads. I will only make one other point - it seems that the assumption is that members post inappropriately in General Writing because it is the first category listed. But one can plainly see all the other subforums at the same time, which suggests that they post inappropriately because they either don't recognize that it belongs elsewhere or just don't bother giving the matter sufficient thought. If that's the case, I doubt changing the order of the subforums will make an appreciable difference. That's what I was getting at in the middle of my previous post. 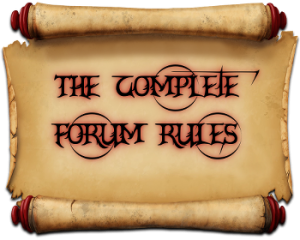 Hence the section to to add a comment about the forum purposes in the rules, or stickying this in New Member Intros. I like the idea of moving General Writing down to the bottom of the list. It's kind of like taking a multiple-choice test - the "none of the above" option is the last one. You look at the previous options before settling on "none of the above." I was, I think, the first to suggest moving General Writing to the bottom when @Wreybies started discussing it. It's just too easy to select General Writing for a question when it's the first on the list. It almost begs people not to look at the other choices. It's kind of like taking a multiple-choice test - the "none of the above" option is the last one. You look at the previous options before settling on "none of the above." This is a really good way of thinking about it. I also like Andrae's idea of adding a short description under each subforum title. Thank you. Since this is meant for brand new members like yourself, is there anything you were hoping to come across here that was missed? The forum software automatically counts your first two critiques in order to get the Workshop Guardian to move aside. That bit is automated. After that it's up to the mods, the Reviewers and the general populace to keep track of things. When it comes to giving a critique, just think about what you are hoping to receive in the form of critique. If you followed the link concerning constructive critique, you'll have at least a basic idea. No one is expecting anyone to write a doctoral thesis analyzing the social commentary made in any piece, but a genuine effort must be seen to have been made. Thanks for the rules... !! great intro...i shall get started! Okay, how about this? I can see the problem with the General Writing tag. How about listing all the other categories first, then re-naming GW "Other Writing Issues." Or something like that. That makes it clear it's for things that are not covered in the other catgories? Thanks so much for this wonderful information. Very helpful to those that are just getting started with the forum. Did I break the rules with my introduction? I wrote very short story that seems to have been deleted. Is this not allowed? You may only post your writing in the Workshop (unless it's like a sentence or two that you have a question about) and the rules for posting there are the following: You need to have been a member for 14 days and have at least 20 posts of which 2 are critique on other peoples' work in the Workshop. For any further work you want to post you need 2 more critiques for each.